This is the blankie I crocheted this Spring, going to a friend of a friend. I did collect compensation, which got a bit of additional bonus. The gal has a baby coming in June, and has already received the gift. I’m told there were tears, and glad to have the letter of explanation. The cotton hat just happened to be on my head when the photo was taken. I crocheted it and will donate to the cancer center Chemo treatment rooms. Here is the letter I wrote as the story of the blankie, which I printed and enclosed for the giftee. When Holly mentioned during Winter Break that she would like for me to crochet a cotton baby blankie for a friend’s baby due in June… I thought– no problem, all the time in the world. Then I went looking at Crafts websites, and realized I should be getting the thread into the house, and Herrschner’s had a “Free Shipping” time going on, and so the color got chosen, ordered, and into the house before Valentine’s Day. Whew! Then came my marathon Yarn Projects for the Mennonite Relief Sale in middle of March. After bags of the small items for Donation and sales, that Saturday evening I was quite ready to begin the bigger project with the tiny thread. I got the foundation chain and 3 rows done that first evening. And then I crocheted every now and then, sometimes taking time aside for a different project such as a friend’s birthday market bag, or a bookmark for a sympathy card. It was a little longer than 2 weeks to do the first 2 balls of crochet thread. I love to listen to music while I crochet, and over Spring Break from my job in the school system, I was on a play list of guys– Donny Osmond. Dan Fogelberg. Bon Jovi. and Darius Rucker. I tied on the third ball on the first Friday in April, but did not hook further. On the first Saturday of April, my husband George, had a medical emergency. I grabbed my crochet bag holding supplies for the Monet Multi colors baby blankie. To pass the time while doing bedside vigil, I crocheted… letting the hook form loops rather than my stomach have knots. Sunday morning, the procedure for his repairs took place. I was alone in the Waiting Room for over an hour, my hands busy with hook and thread. When the doctor came out, he walked over to me, grabbed up the bottom of the blankie, caressing it, and exclaiming over and over how lovely it is. That is a wonderful memory for me, his often scrubbed skin, holding close the fabric. He asked if it is for sale– and at my reply that it is already spoken for, he looked crestfallen. He says if I ever want to make another, he would like to buy it. At last, he said the situation was taken care of, gave me the good news that my husband should be getting better, but he would have to stay another overnight. My mister got to come home on Monday afternoon. on Monday evening, I tied on the next ball of thread. I had crocheted 300 yards (274 meters) of thread, using a 2mm hook, in 2 days. My hobby is a stress reliever. Husband was home the rest of that week, he and the cat looked after each other, so I worked a couple extra days. Evenings, I was just tired enough to be home with tv shows and crochet hook. During the hooking of the last 2 balls of thread, my listening pleasure leaned toward the girls, a cd (new for me) Soundtrack by Linda Eder. Alison Krauss. Enya. Then I crocheted the border while watching a dvd for the third time WE BOUGHT A ZOO. I finished the baby blanket on the last Thursday in April. 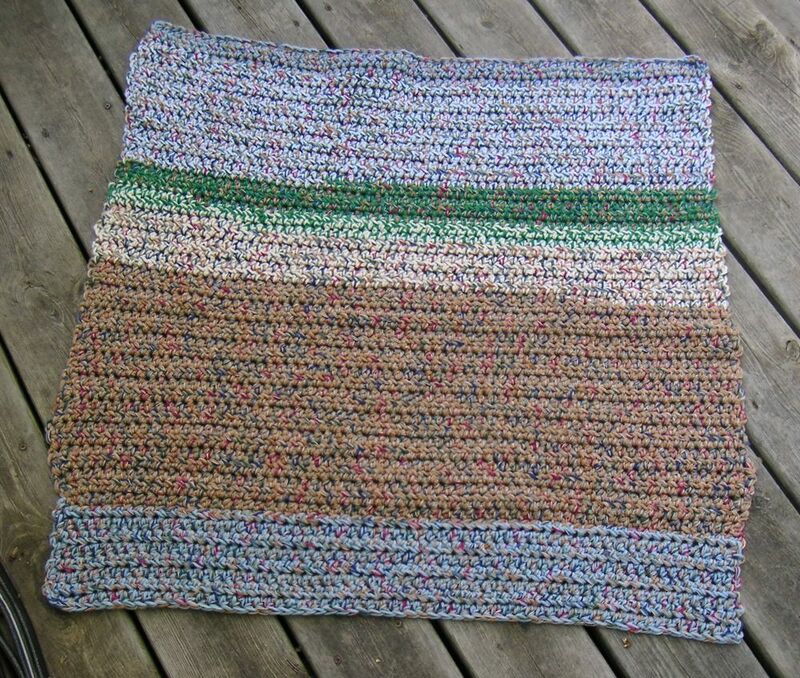 On Friday, I went to my storage bins, chose yarn, then used 3 strands of yarn together, and a very large old wood crochet hook, to make a mat for a dog bed, and will donate to the Humane Society. It was the opposite type of motion, from the small stitches. Today, I looked at the leftover Monet multi thread, and decided to hook a nice, small bookmark for a gift to you. the very same thread, just a different size hook and pattern. the Blankie is 100% cotton, should be laundered in warm water, and perma press dryer. I usually recommend putting inside a Delicates laundry bag, then lay flat while still warm. Have enclosed a wrapper from the crochet thread… Care instructions are printed if you are worried. I hope the new little one will learn to like the blankie. I sure had fun making it! A gal with a kind heart. Married to a nice guy. Empty Nest. Part-time flexible job in the public school system. Loves to work with yarn. This entry was posted in Crochet. Bookmark the permalink. 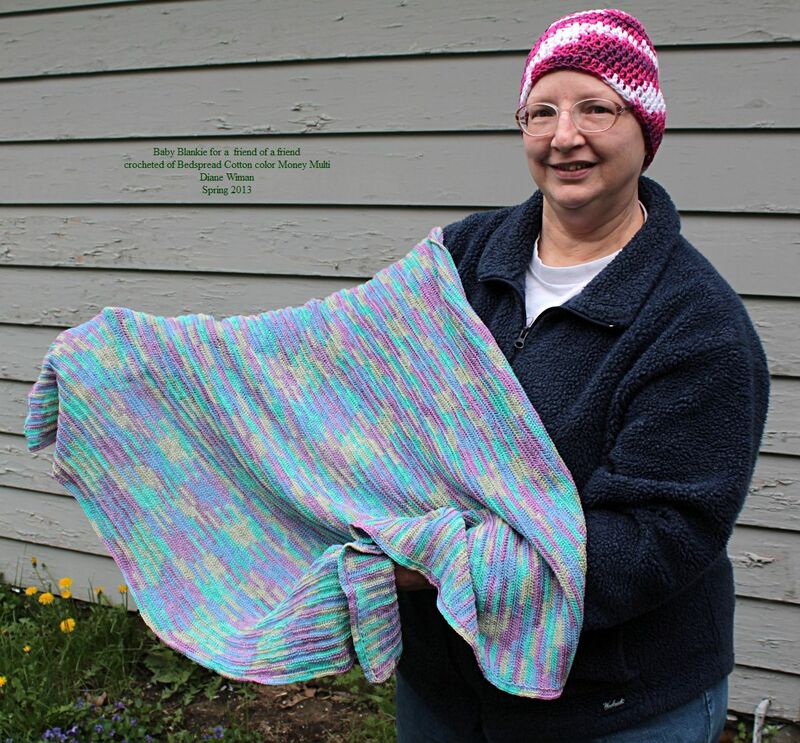 As usual, this project is a beauty and sharing with the mother the process of the making of the blanket is very thoughtful and adds to the “specialness” (may not be a word), of the gift! Oops, I guess these comments are open to the public! 🙁 Back to the blanket–bless you for all the kindnesses you do for others. First I am delighted to see your post. I hope more are forthcoming. Next I think the letter included with the gift certainly makes it more special and was a great addition to it. Third I still marvel at the wonderful things your talented hands create. Thank you for sharing this experience with us. Also tell George I hope he is ( as we said as kids) more better!